Easy to grow’ trailing plants. Grow them on a trellis or trailing over walls or just as ground cover in the garden to produce a wide range of fruit in different shapes and colours. Fancy some fascinating fruits in many shapes, sizes and different colours? Ideal for winter decorations. Climbs/trails to 1.8m (6’). HHA - Half-hardy annual. N.B. these gourds are not edible. 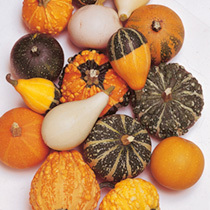 Sow in April, gourds form July-September.